Well it’s finally the weekend and that means it’s time to let our hair down, relax and have Fun or 재미. If you have no plans this evening why not join us? 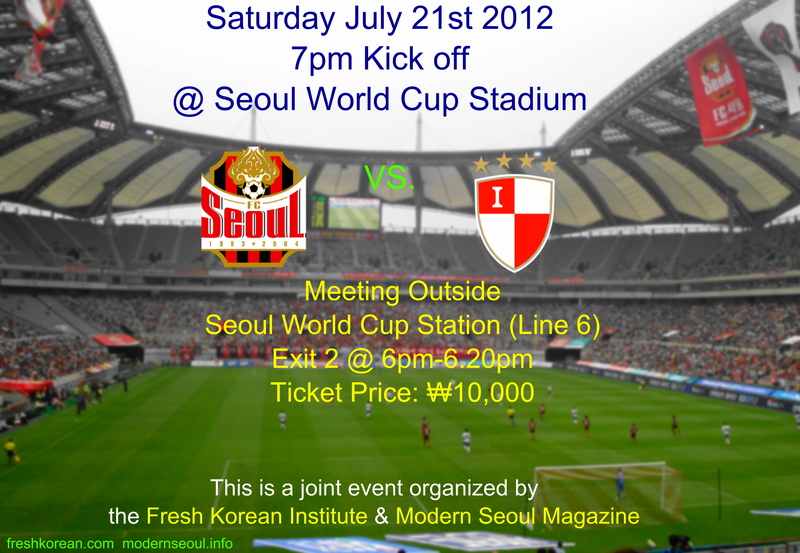 Our first public event is this evening at the FC Seoul vs. Busan game followed by some drinks in Hongdae. For more information please click here: FC Seoul vs. Busan I Park – Fresh Korean Event on Saturday July 21st or check out the poster below. This entry was posted in Korean Word of the Day and tagged Fresh Korean, Fresh Korean Institute, Fun, Fun in Korea, Fun in Korean, Hangul, Korea, Korean, Seoul, South Korea. Bookmark the permalink.